Web design has been one of my specialties since I started back in 1999. I create responsive, image rich brochure style sites for small businesses in Kentucky and nationwide. I also devise more complex business solutions which showcase a variety of products and services. All of the sites I design are very easy for a layperson to update. No coding knowledge is required! Are you looking for a website redesign that is both complete and comprehensive? Perhaps you need an experienced webmaster that will keep your site up to date, as well as optimized. Whether you need a basic design, a few small updates, or even some SEO content writing help, I am your man. Sample my web design work below, then contact me with your website proposal. I look forward to helping you establish and enhance your business’s online presence. Word gets around amongst Kentucky librarians! I have done print and web work for Muhlenberg County Public Libraries for years. Because of this, MCPL’s director recommended me to the staff at nearby Cynthiana’s library system. 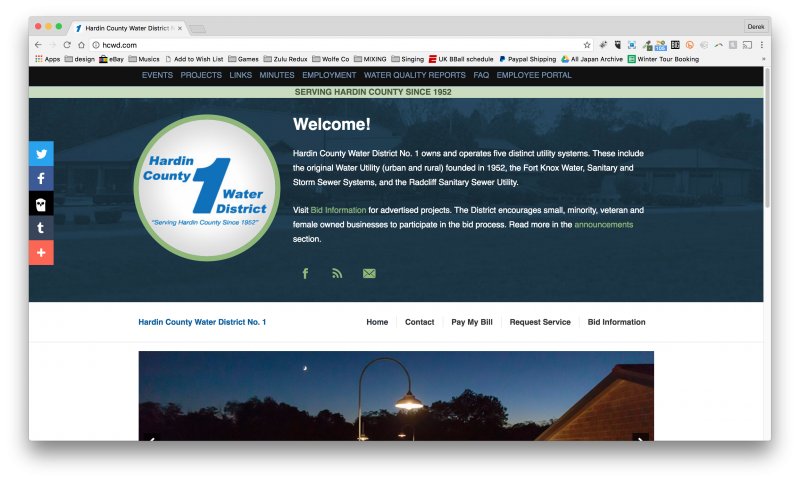 Cynthiana-Harrison County desperately needed a new library web design to replace their dated online presence. Cynthiana’s staff reached out to me with a long list of features to add, as well as content to update. Their existing site was nothing short of a relic. It had not been upgraded in years, and was not compatible with modern users’ phones and tablets. 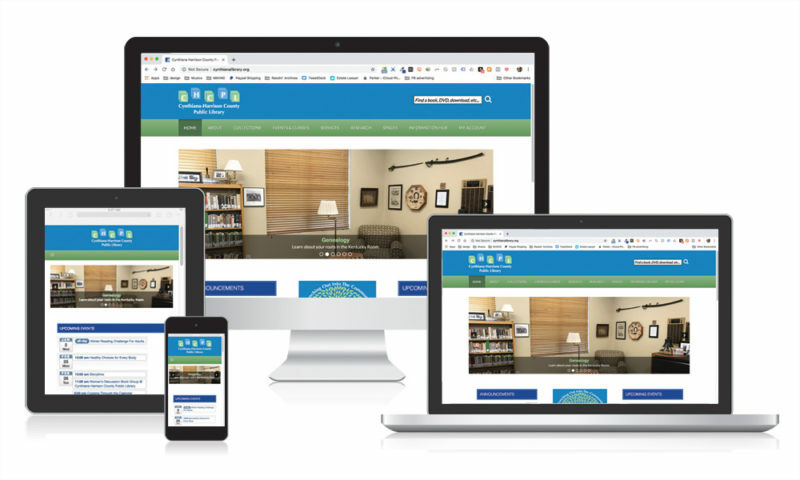 In short, the library web design needed a complete makeover to bring it up to date. The first order of business was replacing the drab maroon and grey color scheme. I instead used a clean, bright pallet of blues and light greens. These colors lined up nicely with their new “tree and building blocks” themed logo design. A pleasing, modern appearance is important, but if the site lacks important features, it is worthless. 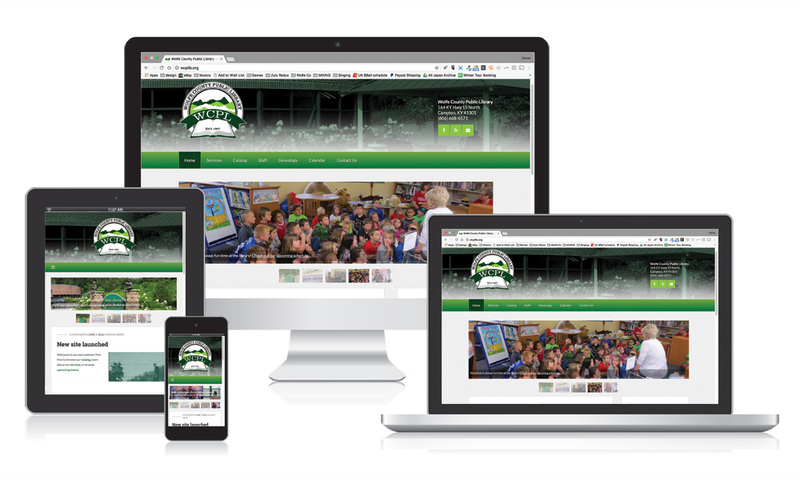 I worked closely with the staff to craft a site true to their slogan “Branching Out Into the Community”. From the top down, Cynthiana’s redesign is feature packed, both for tech savvy users and others who are not. Every important feature sitewide is easy to find from the home page. Whether customers are using tablets, phones, or their desktops, the site is fully responsive. Patrons can search the library catalog directly from the search box in the header. They may also drill down by choosing from categories in the site’s menu. The menu also outlines all of the many programs, services, and spaces the library offers. As the user scrolls down this library web design, the menu sticks to the top of the browser window and follows them. A responsive slider sits beneath the menu. It highlights key content throughout the site with relevant images. I stress to my clients the importance of featuring real people engaging in their products and services. It was evident right away that Cynthiana’s library is a crucial community hub. The photos throughout the site reflect this so well. Below the slider, three columns of widgets expand on what the library offers. The Announcements section lists excerpts of both library and community news. It links to the library’s blog for further information. In the middle, graphics link to online apps and services. The right column features a list of upcoming events. When users mouse over each listing, a graphic and excerpt pops up. 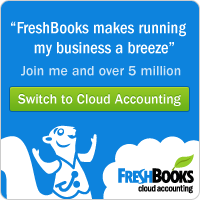 They may click to register for each event and access more information. Kentucky’s public libraries are important to both me and my family. I consider it a privilege to work with library staff to provide their ideal solutions. Does your system need print design or a perhaps a new library web design? Contact me today to get started. I made this 2017 band website design for my own punk rock music project Sempervivi. Sometimes, I perform solo in Lexington and the surrounding region. Alternately, I perform with a full band. In addition to releasing our second EP “Always Alive”, I had a lot of merchandise and other promotional material to design. I hastily assembled a new website redesign which was themed after the album art. However, I was never happy with how it looked or functioned. The layout did not flow very well on mobile devices and the blog focused home page seemed dated. Thus, I carved out some time to create a new site that retained the color scheme of the EP, but fostered a much more user friendly experience. I have been a website designer for almost as long as I have been a musician who plays in bands. Naturally, my profession and my hobby have intersected many times over the years. I am always evolving, and always reaching out to learn better, more efficient methods. This applies to writing and performing songs, as well as designing clean, responsive web solutions. My two passions come together and dovetail in this website redesign project. The main improvements I needed to make included the overall aesthetics. The old site was, frankly, bland and boring. I needed to add some video and bring the overall look of the site up to current tastes. Fonts were to be changed from a conventional sans serif to a more trendy slab. Features wise, I wanted to downplay the blog. While still important, I only updated it every few months. As such, I needed to change the focus of the site from the blog entries to the overall story of the band, the music itself, and upcoming events. The home page header background’s video loop gives a strong first impression. I stitched together performance highlights from several venues into a 30-second clip using Apple iMovie. Since Sempervivi could appear as either a solo act or as a band, I featured footage of both formats. The video is overlaid by a muted shade of the green used for the “Always Alive” EP’s cover. In front of the video background, I embedded a compact Bandcamp player containing the newest EP. Below in large type, the site tagline concisely summarizes Sempervivi in two sentences. Last, the call to action “BOOK NOW” button punctuates the introduction. Visitors can hear my music and get a synopsis of what it’s about, then navigate to my booking form without ever having to scroll down. The most important content all lies squarely above the fold. The next section down reveals a list of upcoming shows on my calendar. A plugin pulls a feed of future performances from the Facebook page. By using this, I avoid having to enter event information twice, as I was before when using an events calendar plugin. If a particular date interests a fan, they can click and go directly to the Facebook event to RSVP. The section’s columns clearly display event dates, titles, venues, and cover images. The rest of the home page contains subsections displaying a longer “About” paragraph and an Instagram feed. Thumbnails and snippets from the most recent blog entry also serve to keep fans up to date. The rest of the pages on the site contain all of the information newcomers and longtime fans alike need. Each individual page displays a different featured image in its header. These range from action shots on stage to candid photos to show band members’ personalities. In particular, I am very happy with how the Song Lyrics page developed. I created an anchored list which comprises of all of the songs in my arsenal. Each section contains the verses, bridges, and choruses for the songs. If a song was featured on an album, I added its individual Bandcamp player above the lyrics. This way, the site’s visitors can listen along to the song while they read the words. The Biography page provides the details on the band’s history, then features clips of glowing album reviews at the bottom. I update my blog every so often with news to keep everyone in the loop. The blog archive page shows a list of the most recent news entries. Each one displays the featured image above an excerpt, which fans can click in order to read the full entry. Next to the blog, in the sidebar, the booking call to action button reappears above the Upcoming Shows feed. Finally, I set up a Paypal store page on the site so that I could sell my merchandise directly. I factored in shipping from my account and created secure buttons so fans who can’t attend a show can still buy my shirts, CDs, stickers, and buttons. Overall, the site condenses down neatly to display on mobile phones and tablets. This responsive design ensures that none of the visitors will get frustrated trying to navigate through the content. The site can meet its goal of expanding my music’s brand. 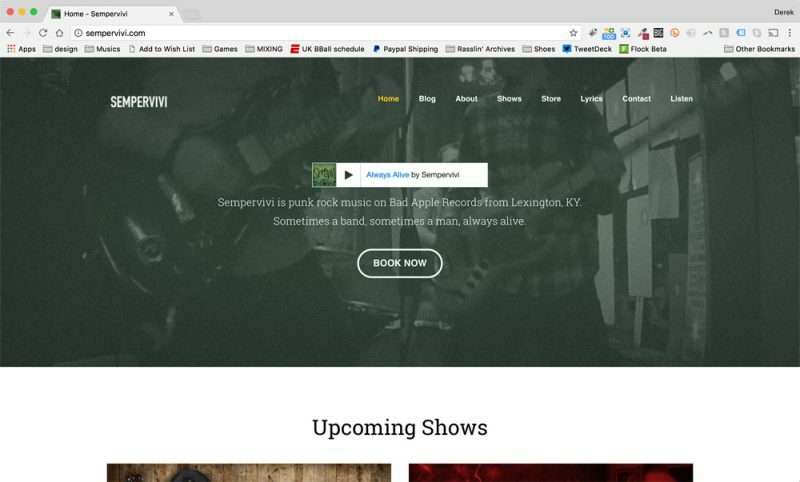 Does your indie band or record label need a fresh, functional new website design? You need a solution that is both easy for your fans to use and for you to update. Contact me today and let’s make it happen!